Were the Chiefs that good, or were the Redskins that bad? One of the few painful moments in Sunday's game was when Marcus Cooper landed awkwardly after defending this pass to Pierre Garcon. KANSAS CITY, Mo. — Is the Red Sharknado back? Or did they just run into another easy target? According to the charts kept at FootballOutsiders.com, going into Week 14, Washington’s offensive line ranked 26th out of 32 in adjusted sack rate — sacks (plus intentional grounding penalties) per pass attempt adjusted for down, distance and opponent — with a mark of 8.1 percent. So it was — well, let’s just say the Redskins were a KINDER mark for the Kansas City Chiefs’ defense than the pockets put up by the Broncos and Chargers. Also, they were playing on a frozen pond, which didn’t hurt. :03 … Will Marcus Cooper be OK after that crazy fourth-quarter fall? Apparently. It looked ugly, though, didn’t it? The rookie cornerback leaped high in the air to break up a Kirk Cousins pass in the end zone late in the contest, but appeared to land awkwardly with his back against the knee of Washington receiver Pierre Garcon, slamming his into the frozen FedEx Field turf along the way. It reminded you a little bit of the scene in “The Dark Knight Rises” (spoilers) in which Bane breaks Batman’s spine over his knee. After lying on the ground for a few minutes, Cooper got up and walked off, even returning to the game a short while later, as team officials said he’d just lost his breath. With three solo tackles and at least two pass breakups — although one was a possible interception he just plain dropped — the rookie from Rutgers put together his most productive single-game effort in four weeks. The site ProFootballFocus.com graded Cooper at a +0.6 overall, +0.5 in pass coverage — the first positive grade he’s received from their scouting department since the win at Buffalo in Week 9. Of course, not having to deal with Peyton Manning or Philip Rivers on a weekend will make any defensive back’s life a little easier. :02 … How close are the Chiefs to a single-season record for non-offensive touchdowns, anyway? Closer than you’d think: Izt’s one to tie, two for a new mark. With two more returns for scores Sunday in Maryland — on a punt runback by Dexter McCluster and a kickoff runback by Quintin Demps — the 2013 total is now 10: four on interceptions, two on fumbles, two on punts and two on kickoffs. The franchise mark is 11, set in 1992 and matched in ’99. More trivia: The ‘Skins win was just the second occasion in team history in which the Chiefs ran a kickoff and a punt back for a score in the same game. The only other time? Dec. 8, 2002, against St. Louis, and by the same man — Dante “The X-Factor” Hall. :01 … So will the Chiefs clinch a playoff berth this weekend in Oakland? And if this team doesn’t win the AFC West, where is the playoff road likely to start? First, to the second question: Most projections are pointing toward Indianapolis. Both TeamRankings.com and FootballOutsiders.com tapped the Colts (8-5) to finish with 10 regular-season victories as of late Sunday night, the fewest of any division winner. That would pit the Colts against the top wild-card entry, which figures to be the Chiefs. With a victory out west, a ticket to the postseason is a done deal for Kansas City. The scenarios for the final AFC postseason spot, with as many as six clubs in that mix, are a little wild, but don’t expect The Andy Gang to fall back into that pack. The Chiefs have 10 wins; Baltimore, currently in the driver’s seat for the final wild-card berth, has seven. 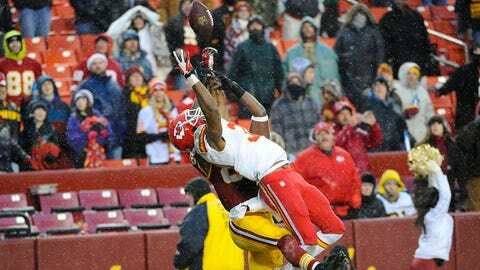 One more Chiefs win guarantees the No. 5 seed — FootballOutsiders lists them as a 95.4 percent certainty there — so it’s particularly hard to see Andy’s men slipping out of the sixth and final slot when it’s all said and done. Mind you, stranger things have happened. Hell, about 15 of them happened this past Sunday alone.